I am so lucky to call blogging my full time job! 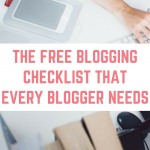 When it comes to blogging, there is a lot that you need to get your head around. You might hear phrases batted around – domain authority, back links, no follow and lots more. 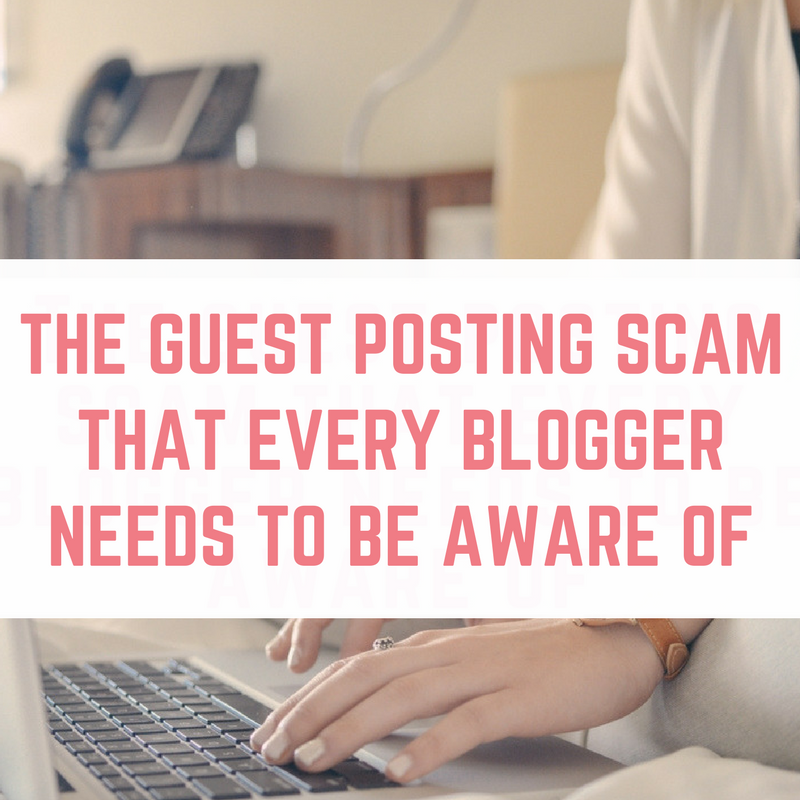 I want to warn bloggers about the guest posting scam that every blogger needs to be aware of. First things first, this isn't a scam…exactly. No one is trying to con you out of your hard earned money, but they are being dishonest about their request. Guest posting is where you write a blog post for another blogger to host on their own blog. If you are writing about a topic that you have already written about in the past on your own blog, then you will need to make sure the content is different and not copied word for word. 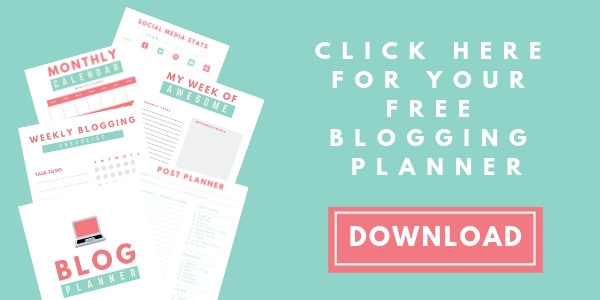 You can choose to swap guest posts, where you write something for a blogger and they write some content for you. Or you can offer to guest post on other blogs without publishing a guest post on your blog. It is really flexible. Why do bloggers do guest posting? Guest posting is actually really beneficial for bloggers, and I would actually encourage it for a number of reasons. If I host a guest post by another blogger, I am getting content for my blog that is within my niche, but not something that I would normally write about. For example, I don't have children, and by hosting guest posts about saving money with children, I am appealing to my audience who do have children. 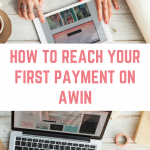 The person writing the guest post is also likely to promote the post on their social media platforms, and maybe even their email list, meaning that I can reach new readers. Hosting a guest post also saves me time, and frees me up to do another blogging related task. 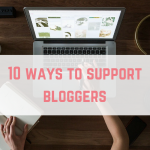 As for writing guest posts for other bloggers, it means that I am reaching their audience who might like what I have to say and come back to my blog. Most crucially for me, it gives me a chance to boost my domain authority. A lot of the PRs and brands I work with want bloggers with a high domain authority, so increasing this is something that I work on regularly. What is the guest posting scam? The guest posting scam usually starts with an email, from someone claiming to be another blogger. They may, or may not, give you a link to their blog for you to check out. They want to write a piece of content for your blog, which you might think sounds great…until you receive the guest post. Inside you find that actually, they're linking to a brand, a product or a service. They're not actually linking back to their own blog. You might find that they're linking to something that doesn't align with your brand values! This is not a guest post – this is a sponsored post. As a blogger, I have spent a lot of time working on growing my audience and providing useful content. If a brand wants to advertise on my blog, by way of a post linking to them, and they want to reach my audience and have a share of my domain authority, then this should be a sponsored post, and paid for accordingly, not a free guest post. 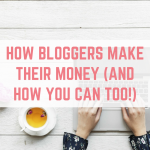 You might be interested in how bloggers make their money to get more of an understanding of sponsored posts. I accept guest posts from other bloggers – in fact I have guest posts every Wednesday! I accept these from bloggers I know, not from people who I have never heard of. If I haven't heard of their blog and they don't tell me what their blog is, I send them my media kit straight away. Genuine bloggers will reply back telling me their blog link and the brands or PRs then go on to negotiate or tell me that they “don't have a budget”. 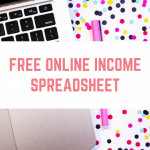 Not having a budget is an excuse that I see a lot – remember that they are paid to place content (usually with links) and you do not have to accept guest posts for free if someone else is benefiting from your hard work. If you are looking to host or publish guest post on other blogs then there are plenty of ways in which to do this. I frequently swap guest posts in blogging Facebook groups I am active in, and respond to requests to write guest posts. Whilst this isn't a traditional scam, it is dishonest when someone is trying to get links placed on your blog, completely free of charge. Don't be afraid to ask what the content will be, and where the links will lead to. Another blogger should just want links to their home page, whereas someone looking to gain from this guest posting scam will be linking to something else entirely. 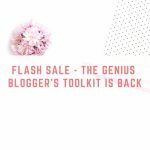 FLASH SALE – The Genius Blogger's ToolKit is Back! I don’t know why this surprised me, a lot of people expect something for nothing. It does anger me that they want their advertising for free and probably get paid well for it! Exactly that – they’re getting paid by someone to place links, and they’re being shady about it. I’ve done it for free in the past when people have been honest and it has been a good fit for my readers. Doing it like this takes advantage of some lovely bloggers. This is such a hot topic at the moment. 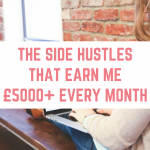 I’ve been offered these too and you’ve just got to stand your ground if you’re not happy, however busy you are and could do with the extra content. Otherwise it just encourages this shady practice further! I didn’t even know this was a thing! I only accept guest posts from blogging friends or people who I know in real life. I have yet to feature or write a guest post for anyone so this is useful for me. Thanks Emma. I have learnt that it has to be “GIVE GIVE GIVE GIVE” first and “ASK ASK ASK ASK” later. It seems that some people do not want to share. Friendship should be first – $$ should be later. Understand this rule and you will be far richer. It took me such a long time to understand this concept and I’ve fallen for this in the past more times than I care to remember. I’m glad this is being publicised now so more people are aware of it. I have emails in my inbox almost every day from ‘bloggers’ asking to ‘collaborate’ with me by sending me one of their posts. Not going to be posting anything for free from now on unless it’s from someone genuine and familiar as you point out above! I agree they are most likely well paid for placing these links, and as such we should treat them as sponsored content and not a guest post. Thanks for posting this. Wish I had read it a long time ago! . Oh yes, I find this ultra annoying too. I’ve been getting more and more requests which is really annoying. Some of them offer to pay. Some offer a little. I had one offer a lot and on ongoing basis, but I really don’t want want link juice being drained for commercial purposes and I have no control over the content. I also get annoyed by those that say the blog posts are related…because they’re both home improvement. Well insect/pest control is not related to hardwood flooring and upscale home decor. I need to guest post more (and I think just found a local blog where someone was asking for volunteers. Yay. In general though, I just guest post with people I know and trust. I agree! Only accepting guest posts from people you know is the safest bet! This is a very helpful post. I’ve gotten to the point where I’m starting to have conversations with other bloggers about guest posts. Fortunately, they’ve been credible and came about through relationships in various Facebook groups. 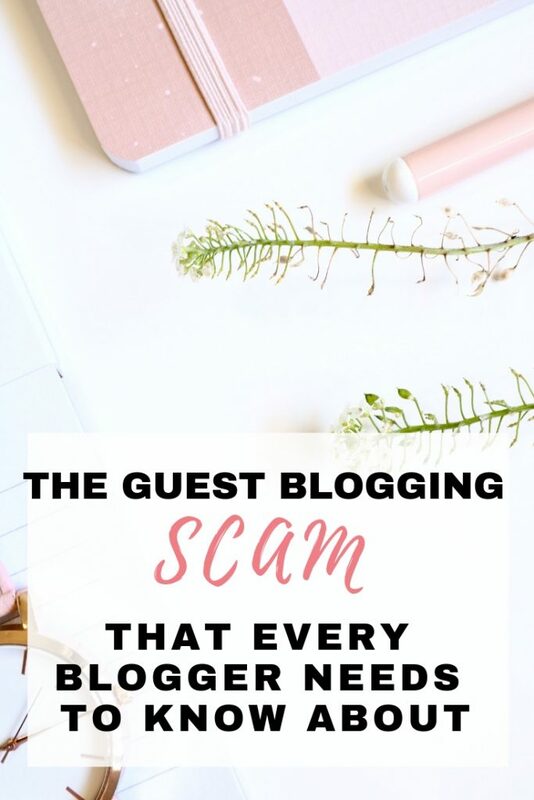 I’m glad you shared the warning signs about blogging scams because until reading this post, I was unaware that was a ‘thing.’ Thank you!! So pleased you found this helpful! Finding buddies via Facebook is a great idea, as at least you have a relationship with them first. Yep. I get these emails all the time! So annoying. Yep, they don’t give up, do they? Worth a read guide and some useful information here. Emma, I’m not sure I agree that this is a scam, you even said it wasn’t in your article. I gotta give it to you to work in the the keyword phrase though! I actually ended up here researching a specific company. People do pay to have guest posts done for them in order to get backlinks but I don’t see it as a scam. Better companies (that are out of my price range) will create useful articles. They will work with the blog owner on topic, etc. I do agree that most are looking for a “guest post” are looking to post a bad article someone wrote for $5. I pass on them about 98% of the time but if a company comes to me willing to work with me and provides a well written article that will be helpful to my readers, I accept them if the link they use is not shady. I may also accept but tell them it will be a NODOLLOW link. But again, only if the content is worthy and the link is not shady. My site is related to dogs, it’s my passion site. In any case, it is good for people to know about this but I would not automatically pass without giving them a chance to show you what they have to offer. The “scam” in this case is when a company poses as another blogger to get their backlink/guest post, not that guest posting and getting backlinks is the scam. If a company wants links and posts, they should pay – not try to hide under the guise of being a fellow blogger. Hmm, when are people going to appreciate the hard work that goes into creating and maintaining a blog, and act accordingly? I’m way more interested in brands that want a two-way beneficial relationship! The best is when they all use the same templates we’ve all seen a thousand times. You can spot them a mile away. Yes!! Totally agree with this. Your post is informative. I accept only Guest post from friends and fellow bloggers. I recieved an email from someone who wanted to do guest contribution on my site and are willing to pay $120, have you ever had this kind of email. Plus my site is not that old. Yes, and it may be the real deal. I’d email them back and find out for sure. Good luck.